With all my major goals for the trip achieved, except for returning home alive, and with just 4-5 days left to travel, I was gripped by the feeling that now nothing was important. I felt like I just had to hang in there and soon I would be home again, able to enjoy such everyday luxuries as ice cubes from the freezer and my bath tub. In my experience, this kind of feeling can kick in at any given moment on a long-duration journey, especially after I have done something really exciting. If it's in the middle of a journey, the only cure is to go to a quiet and pleasant place, preferably with a beach, but if it actually happens near the end of a journey, just let yourself start thinking of the joys of being home, and start counting the hours until your plane leaves. The experiences you have will maybe not be very intense, but you'll walk around with a smile on your face all the time nevertheless. To save myself from 24 hours on a bus, I took a plane to Arequipa early in the morning. There I discovered there are no day buses to Nazca, which was my next planned stop, so I changed my plans and went to Camana instead. Camana supposedly is a beach town, which I guess technically is correct if you count deserty Southern Peru as a beach. Noone's ever heard of Camana, and there's a reason for it. There was a restaurant there with the shortest menu I've ever seen; They served 1) Chicken, 2) Fries and 3) Chicken with fries. I chose chicken with fries and found a table in the back of the restaurant, where I could watch the locals watch the elections on TV. These were a bunch of relaxed locals, neither discussing what they saw nor throwing chickens at the TV. I had a feeling there probably wasn't lined up any water cannons in this town, and almost wished I was back in Cuzco, where there undoubtedly would be more action going on. So I just went back to the hotel and slept. 30 nuevo soles, hot showers, but here it was warm enough that it didn't matter. There was even a mirror in the bathroom! The reason for the low prices was of course the low demand for hotel rooms. And the reason for the low demand was that the "garua", an annual heavy fog that covers the whole coastal region of southern Peru, had arrived and would hang around for the next eight months or so, cancelling anyone's tanning plans. In the morning the elections were still undecided, there would have to be a new round in a few weeks, which may have been the reason the locals were so little affected the night before. I fled the town in a San Christobal bus, whose sign in the front promised to take me to Nazca for 25 soles. It didn't say anything about our lunch break, though. About halfway to Nazca the bus turned off the coastal highway and into something that looked very much like a prison, with high walls and a barbed wire fence surrounding it. It wasn't a penal institution, though, but a roadside restaurant with pretty much the same menu as the one in Camana, and without any neighbours for many miles in any direction as far as I could see. Not feeling like eating chicken and fries again, I decided to consider the place a prison afterall, and pretended to escape from it. It wasn't too hard, and after a bit of wallclimbing and bleeding I was at the beach, where I interrupted a squadron of vultures who were in the process of devouring a previous escapee, or maybe it was a seal. It definitely was something with a lot of blood in it. I decided to head back to the bus just in case. Except for some breathtaking dunes just north of Chala, there was nothing worth stopping for before Nazca. The moment I stepped out of the bus I was assaulted by a number of hotel pushers. I was prepared for this, as I knew that everybody come to Nazca for one night and a flight over the geoglyphs, and the commisions these touts can get out of bringing a person to one particular hotel/flight agency (in Nazca they're always both) can be pretty hefty. Competition is fierce. There is one hotel, though, with a fairly good reputation for treating its guests well, and that was where I was heading. I told everybody so, but in lack of anything better to do, I had 4-5 of them hanging around me telling me the hotel was closed, full, on strike, had fallen down after the large earthquake, burned down and besides it was twenty kilometers away. They didn't leave until I actually entered the Hotel Alegria building, which seemed mysteriously little damaged and/or closed. A large room with a private bath, TV and lots of mosquitoes cost me 30 soles. I also booked myself onto a morning flight over the Nazca lines for US$30. I tried to get a new book from the hotel's book exchange, but the silly old woman behind the counter, who probably was illiterate anyway, rejected my proposal on the grounds that the book I had was too small compared to the book I wanted. And no, it was not possible to pay for the difference. Evil witch. I may be slightly biased because of the book exchange episode, but I have to say that I feel that Nazca is ridiculously overrated. In the morning I was dropped off by a minivan at a small piece of tarmac that claimed to be the aeropuerto, and quickly swallowed a couple of Dramamine pills against motion sickness. It turned out I got to sit in the co-pilot seat in the cockpit, immediately feeling at home as I recognized all the controls from Flight Simulator 2000. Sadly, I was only to be flight assistant, and the old, rounded man that entered the other pilot seat seemed to know he was doing and would not need much assistance. Having done this flight 20 times a day for the last 30 years, he probably could do this in his sleep, and I suspect that was exactly what he did. He didn't say anything, just started the plane and up we went. We were taken to see the spider, the astronaut, the air field, the colibri, the condor, the pelican, the dog, the monkey and all the other lines that are waiting out there in the desert for a major flooding to come and wipe them off Earth's surface. They really aren't as large, impressive or visible as popular belief has it. Granted, many of the lines are very long and very straight, but I, for one, definitely think they could come up with these lines without the help of any hot-air balloons or spaceships. I know I could. Nazca is definitely just a "been there, done that"-thing, unless you're Erich von Daniken. It's more probably a result of indian boredom or witch doctorism than of any alien presence. I slowly moved closer to Lima, this time stopping in Ica, a busy city surrounded by beautiful dunes. The streets are full of people who try to sell anything, the cars are desperately trying to find their way between the stalls, and the houses are pretty successful in falling down onto the sidewalks, which probably is the reason the vendors have moved from the sidewalks onto the streets. In the chaos of three wheel cabs, trailer bicycles and ancient buses I almost made my way into a new carreer. Not knowing that in Peru video cassettes have just about killed all movie theatres, I figured I'd go in and check out the new flick running at Cine Dux with the intriguing title "The Secretary"/"La Oficinasta". I was stunned by the ticket price they demanded, it was an astronomical US$10. It turned out it was the sign-on fee to get into the secretary studies at the local university, which had taken over the previous cinema without bothering with replacing the big sign outside. So there was no movie to see, which was too bad, really, since Ica is inland and four hundred meters above sea level, so that I was now over and outside of the garua, and the temperatures were about 40 degrees Celsius and I couldn't find air-conditioning anywhere. So instead I went to the Plaza de Armas and sat down on a bench in the shadows, listening to the buzz from the people and the birds in the trees around me. I sat there until it was dark, having my last real, tropical sunset in quite a while. I counted less than 100 hours until my plane would leave Lima, and smiled. With only two days left in Peru I finally braved myself to go to Lima. I chose an Ormenos bus which for 12 soles would leave from Ica as soon as the bus was full. The driver couldn't understand why people would go on the Soyuz buses that leaves every 15 minutes for Lima for 15 soles, when they instead could go with Ormenos for 12 soles slightly later. At first I kind of agreed with him, but 45 minutes later I didn't. We left after an hour of waiting. Whichever bus you go on, the ride is a miserable four hour journey through a grey desert with an even greyer sky, at least in the 8 months the garua fog rules the region. And when you arrive, it is in a despondent capital with kilometer after kilometer of shantytowns before you get to an area where there are real houses, but you really don't want to go outside anyway. Instead, you want to cling to the bus driver and say "Take me away from here, por favor! ", or at least give all your money and valuables to someone at random, so that's all over with. I checked out my map, and figured if I walked quick and looked straight ahead, I should be able to make it to Posada del Parque, a small hotel nearby that was recommended by Lonely Planet. Besides, there were so many suspicious-looking people at the bus station that I reckoned there couldn't be many in the streets around it. That prooved true, and I actually did make it to the hotel, but, since it was the first hotel recommended in LP, it was of course full. The hotel owners gave me the address of another hotel that might have space left, and I got in a cab with two clueless Americans and took off for Imperiale, straight in the middle of Miraflores, THE safe neighbourhood in Lima. To my joy, they gave me a US$25 room, and now I was certain I would survive Lima, as the area looked most agreeable to me. There was even a KFC around the corner. Anyway, I give Imperiale my warmest recommendations, it's good in all ways, and should be a good and safe way to start your own South American adventure if you, and don't ask ME why, should choose to use Lima as your starting point. It's so posh it's even got the hotel's name on the soap, a definite first (and last) for me on this trip. There was even a bidet in the bathroom, making me feel like Crocodile Dundee for a while, as I actually pondered upon what this gadget was meant for. And all this for US$25 per night! In all fairness, Lima has quite a few spectacular museums and highlights for its visitors. The only problem was that they were all closed, because of the ongoing Holy Week/Easter celebrations. The good thing about it was that there were relatively few people left in Lima, a lot of people had left to visit their families in other places. So I felt fairly safe walking around on my own, even when I strayed out of Miraflores, a part of Lima that is typical for the city the same way White House is typical for Washington, D.C., I think. There are 24 hour supermarkets (Santa Isabel, where they sell Flipys! ), lots of boutiques and luxuries stores and police everywhere. I enjoyed it very much. I had a good day's walk on my last full day in Peru. 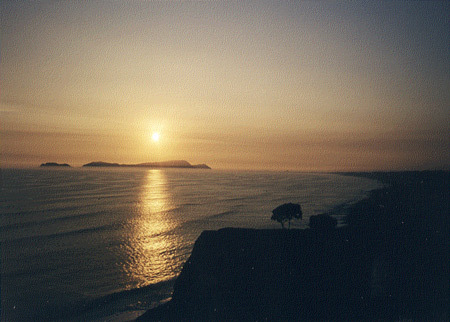 I started out in the morning from Miraflores, walked out to the cliffs over the beach, and walked on the cliffs northwards. The map in the phonebook told me this was the area where all the embassies in Lima are, so I figured the neighbourhoods in this direction should be ok. They definitely were, with many grand, old buildings to look at while I walked. Every now and then someone would come up to me and offered me to lease their sister, and they were pretty insistent that I really needed a chica. I just practiced my Spanish with them, while walking fast, and most of them could only keep up with me for a couple of blocks before they became tired and gave up. After a good, long walk I arrived in San Miguel, at Parque de las Leyendas, the park of the fairy tales. I figured this would be a good place to look for Paddington's Aunt Lucy, who supposedly live in the darkest Peru. I always thought that meant "darkest" as in "in the middle of the jungle", but the book must have meant "darkest" as in "the most polluted part". The park is Lima's zoological gardens, and charged 6 soles to let me in. I didn't see any of Paddington's ancestors, and soon remembered how I feel about the way third world countries treat their animals, and left. I walked back to Miraflores as well, past hundreds and hundreds of really nice houses. I also discovered a huge church, Corazon del Mariæ, which stood out, titanic in size, like a converted Moon rocket with lots of decorations on it. It's really something, but I never found any information about it in the guidebooks. Check it out. In Miraflores I had a shower that was very much called for, played around with the bidet a bit and went down to the beach to watch the sunset. Simply beautiful, as you can see below. Now, on my way back to the hotel, the scariest thing on my whole trip happened. It was now ten years since I graduated from high school back in my tiny hometown, Brønnøysund. That was the last time I saw Henning. Now, as I was waiting for my take-away pizza to be ready, he walked into the same restaurant. Everybody has a story about some amazing coincidence that happened to them. This is mine. I walked over to him and casually said "So you're out traveling as well", and judging from the look on his face and his sudden inability to talk, I think he was pretty amazed as well. My last morning was spent packing, and I somehow managed to squeeze everything I wanted to take home into my backpack and my daypack, 30 kilograms altogether, including the souvenirs I bought for my last few soles. That was quite a lot more than I started out with, but I had also lost enough kilograms of body weigth to more than even it out. I surprised Renato, the manager of Imperiale, by asking him to get me a normal taxi instead of taking the airport bus. He asked me a couple of times if I was really sure I wanted to do this, and I said yes, not really understanding why this was an issue at all. So he took me out to the street, where at least 15 cabs must have passed us before Renato found a driver he trusted would actually take me to the airport instead of driving me into the wilderness and rob me. I got in and it was quite a long ride, so I started talking to the driver. Suddenly it struck me that here I was, having a conversation with a sane person about the social politics of Peru, in Spanish, and I was on my way back to Norway. Suddenly it felt all wrong. I could stay here. I would be fine. Traveling on would be even more rewarding than the trip had been so far, now that I knew the language and everything. Then I sighed, thought about ice cubes and bath tubs, and decided I was going home afterall. Oh, and the driver DID rip me off slightly anyway. He came up with a story about forgetting his driver license at home, and without his license he would not be allowed into the airport area, so would it be okay if he just dropped me off outside the gate to the airport? He didn't mention that this would save him a five soles fee for entering that area, but I understood what this was all about, smiled, and gave him all the soles I had left and wished him a happy life. The rest of the trip was, as they usually are in international airports, quite smooth and without any events worth noting. Lufthansa did their job, and I was soon home again. For those of you who have questions about my trip that hasn't been answered through this journal, feel free to get in touch with me. If you wonder what it cost, I estimate it to come to about 50,000 Norwegian kroner, or US$6,000, including everything; airfare, lodging, food, trip to Antarctica, inifinite packs of Flipys, coca leaves and so on. A trip like this also takes a lot of insistence and energy, which I hope you already understand from what I have written. But this part of South America is definitely something anyone can do. You don't need to know Spanish, you'll get by without it as well. Sure, there are many long distances to cover by bus, train or plane, but there ARE lots of buses, trains and planes, so getting around is easy. Hey, if it was good for you, please drop me a line!